"A flavorful side dish of Indian cuisine. This dish blends the mild flavor of cumin with the unrelenting spice of curry. A truly engaging dish." Place whole potatoes into a saucepan with water to cover. Bring to a boil, and cook until just tender. Drain, and cut potatoes into quarters. Set aside to keep warm. Heat oil in a large saute pan over medium-high heat. Saute the cumin, turmeric, and curry powder for 1 minute. Add potatoes, and saute until toasted. 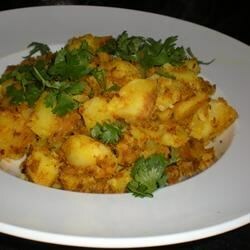 Toss potatoes with sea salt, pepper and fresh cilantro, and serve hot. A truly delicious side dish! We had it with Basmati rice and Indian Chicken Curry II. I did follow the advice of a previous reviewer and reduced the salt to just 1 tsp.. It was excellent. Enjoyable recipe, I think next time I am going to try using the same ingredients but roast in the oven instead, also think I will reduce the turmeric to 1 teaspoon. Thank you for sharing.